In order for Windows users to gain understanding on how Windows is assigning physical memory, how much file data is cached in RAM, or how much RAM is used by the kernel and device drivers, Windows Sysinternals team has released an advanced physical memory usage analysis utility for Windows Vista and higher version of Operating System including , which is called as RAMMap. 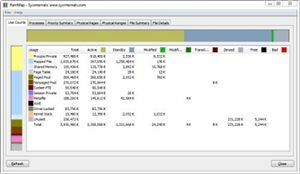 With RAMMap, the users able to gain understanding of the way Windows manage memory, to analyze application memory usage or to answer specific questions about how RAM is being allocated. Besides that, the memory analysis utility tool also supports saving and loading snapshots of the display result. The RAMMap works well in Windows Vista, Windows 7, Windows Server 2008 and higher.